I started with a sage green card base and added a piece of patterned burgundy paper to it. I added a piece of gold ribbon across the center. 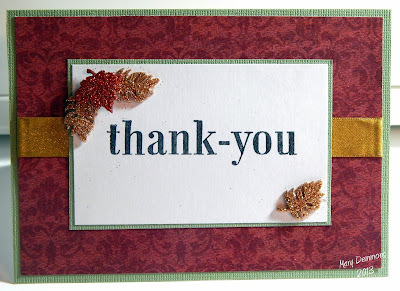 Then stamped the sentiment "thank-you" onto white card stock and backed it in sage green before adding it to the card center. I added 3 glitter button leaves to the top corner of the sentiment and 1 more to the bottom corner of the sentiment. A beautifully balanced, CAS thank you card. Thanks for joining us this week at Sister Act Card Challenges! Sheena B. Awesome CAS card!!! Thanks so much for participating in our PILE IT ON challenge!! Hope to see you again for our next challenge! !